This is a picture of Spinner. She has been my constant companion for almost 14 years. 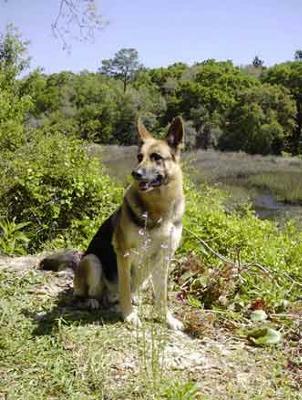 She is trained in obedience, agility and search and rescue. She had such drive and tenacity for finding people and doing everything I asked of her. She gave me two wonderful litters of pups. A better mom you couldn't have asked for. One puppy, Bravo, became a bomb detection dog. As this picture shows, she enjoys the warm sunny days of Florida. I feel this is a tribute to her as she has become very old and fragile. I have ordered her a wheelchair to help her get around and enjoy the last months of her life and go for the walks she loves so much. It will be so hard to say goodbye. It was agony to say goodbye to Brandy (aka, the superhero Captain Power Paws) a few summers ago. Spinner's death will be worse than an ax blow to your chest. but....it was Spinner's turn to live with you at one time. The cycle of life continues. It will be someone else's turn very soon. You will get a new shepherd pup and that pup will have a long and fun life. Saying goodbye is agony, but remember that you get to bring home a new baby after that. Keep a photo of Spinner on the mantle, and tell funny stories of her constantly so that she'll live on in your heart.